"End this. It's like larkspur. It's deadly." Then I awoke. The dream in essence told me that homeopathy is not a toy and not to be taken lightly, or taken like most people pop vitamin pills. Homeopathic remedies can be extremely potent, and I had sort of lost sight of that in my quest to maximize the use of wild yam and its properties. Lesson learned! A couple of nights ago I dreamed of two of the most beautiful dresses I've ever seen. They appeared to be silk and were not plain, but definitely not fancy, maybe classy. One was the deepest, richest royal blue, and the other was the most intense emerald green and each dress was totally gorgeous, and they may have been identical, except for the color. I was wearing the blue one one day, and the next day I wore the green one. Then the day after that I put the blue one back on. So, in essence I only wore the green one one day, and it seems the blue one, before and after. I'm wondering if wearing the green dress--for one day only--somehow relates to a group meditation I'm about to participate in? 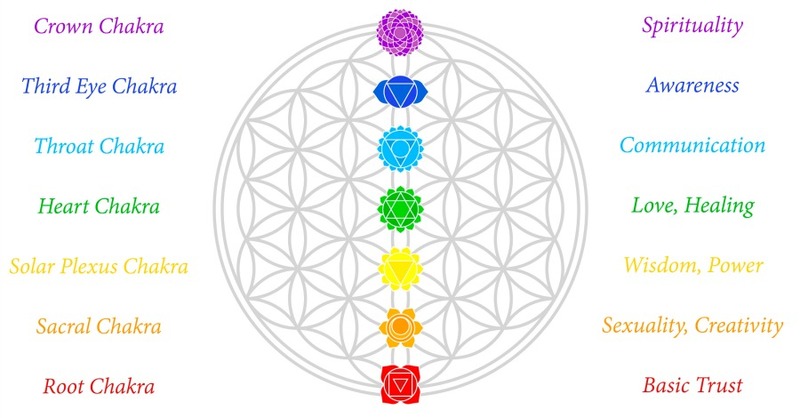 I've not studied what the colors mean, and maybe need to see what colors relate to chakras. Aside from these questions, I'm not sure what to think. It was a pleasant dream because the dresses were so beautiful, and I rarely wear dresses in "real life" here on the farm where I'm usually in torn blue jeans, mud-spattered hats, coats, gloves, etc. Blue=Living mostly in the head, intellectually? Green=Transitioning to the heart, even for a special occasion? Back to Blue=Maybe switching back to what's comfortable for a time? Blue: Continuing to envision and co-create other things into existence? Looking at your chart makes it all make sense. I'm usually focusing on having my third eye "on call" at all times. But the moment the upcoming honeybee meditation begins, but I must focus on the heart/my heart and the vibes that connect through all of our hearts to our beloved honeybees. Maybe it's also a reminder that both the third eye and the heart can be the object of focus at the same time, and I don't need to jump back and forth. I feel that I need a larger understanding of the whole topic of chakras. Maybe one of our Mods could do a tutorial that goes beyond this chart? Will just note that for some reason, any time a teacher switches into using Sanskrit words, my brain fogs up, so anything in simple English would be deeply appreciated! Same here with my brain and Sanskrit terminology. Or for that matter, anything not in English. I'm all for learning foreign languages, and regularly use duolingo.com for Spanish, but when trying to learn something basic such as chakras and things related, I want something I can remember! Not words that are already foreign sounding. That's best left to the "learning a new language" department. I'll find a topic somewhere here on the TH and post what little I know about chakras. I always consider it a good sign of bodily and brain health, spiritual health when a person has a beautiful dream with vivid colors. That is a good thing. Thanks Ilinda - looking forward to it!